Sudoku puzzles have been popular for several years now. They are neat little exercises in counting, pattern recognition and logic. The concept is easy - fill in a grid (usually 9x9) with the numbers 1-9, making sure each number appears only once in each row, column, and 3x3 partition. Kids (or beginners) can start with easier versions like a 4x4 grid, or a low difficulty level (more numbers prefilled). A great site with lots of free puzzles is Daily Sudoku, and you can find numerous paper and pencil versions in book stores. But in case your kid gets bored of counting to 9 over and over (or just does not have the attention span for those large grids) you might want to try Ken Ken - Sudoku's mean little brother. Ken Ken is also played in square grids, and like with Sudoku, the objective is to fill in numbers, with each number appearing just once per row and column. The smallest grid is just 3x3. Sounds easy, right? Ah, but there is a catch! There are no prefilled numbers. Then, Ken Ken carves out smaller portions of the grid and shows a mathematical operation and the result to be achieved by adding, subtracting and so forth. 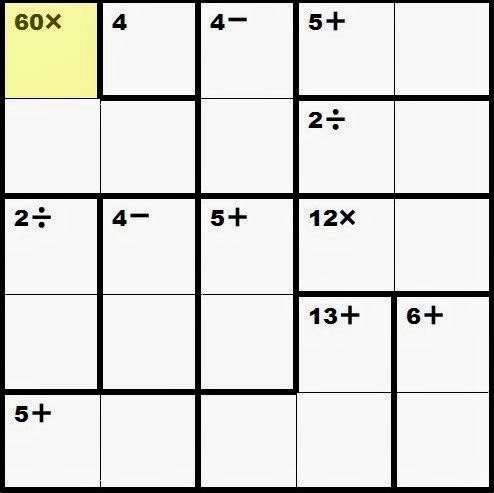 A 5x5 with all 4 operations can already be very challenging. Try the one above! For paper and pencil versions I like Will Schortz's books, that come in "tame", "wild" and "ferocious". And for electronic versions Kenken.com provides puzzles in all sizes, operations and difficulty levels. Enjoy! Thick fog wafted out of the cauldron, where a green mixture was being stirred by a hand in a giant glove. My 5-year old waived to me to lean down and whispered "It's Magic!" "No", I whispered back, "it's way cooler than Magic. It's Science!" Read the rest on Geekadelphia.com! And mark your calendars, Drexel plans to repeat this every first Saturday in February.